Surrounded by peaks soaring to 14,000 feet, the town of Estes Park sits in one of Colorado’s most beautiful spots. It’s also next to Rocky Mountain National Park, a “must see” spot for visitors to Colorado. Estes Park’s commercial areas are touristy but fun, hotels are plentiful, and sights include everything from souvenir shops to the town’s magnificent herd of elk. skiing, depending on the season. 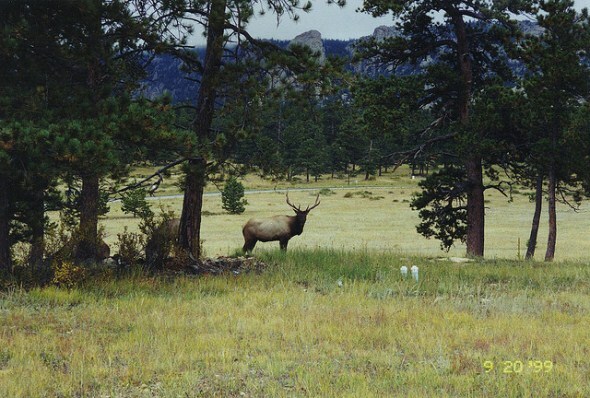 The “big five” of Colorado wildlife are plentiful, both in town at times and in the national park: elk, bighorn sheep, black bear, moose, and mule deer. Activities abound in all four seasons. Not to mention Rocky Mountain National Park out the back door, which attracts some 3 million tourists each year. Land area: 5.9 square miles. Altitude: 7,522 feet above sea level.